The Brita Aqualux Water Pitcher turns ordinary water into healthier, great-tasting drinking water without costing a fortune and without the waste of bottled water. With Brita's advanced filtration process, you can enjoy water that's free of harmful substances and unappealing chlorine taste. Despite its slim profile, this smartly designed pitcher has capacity of 48 ounces, making it perfect for the whole family. Each Brita filter helps reduce waste by substituting for an estimated 300 water bottles. A flip top lid makes refills easy, and an electronic indicator ensures that you know when to change the filter. Purified water is a powerful way to keep your whole body revitalized and uplifted. 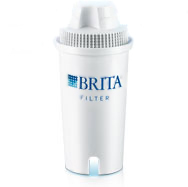 All Brita Pitchers are universally compatible with Brita Pitcher Replacement Filters. With the Aqualux Water Pitcher, you and your family can enjoy clean, better-tasting water straight from the tap. The pitcher's included Ion Exchange Resin filter acts as a magnet for impurities that are often found in tap water, such as lead, copper, mercury, cadmium, and zinc. The filter removes these impurities, reducing their potentially harmful effects. The filtering process also reduces that taste and odor of chlorine, thanks to a special sponge-like filtration system. The end result is clean, better tasting water that is healthier for everyone. This is especially good news for children and pregnant or nursing women who are more susceptible to potential harm from lead and other impurities. Filters should be changed every 40 gallons or two months and are not intended for use with microbiologically unsafe water. Changing your filter regularly ensures that you will always have clear, healthful, great-tasting water. The Electronic Filter Change Indicator makes it easy to know when it is time to replace your filter. Every two weeks an indicator bar will disappear from your pitcher's electronic display. After two months, when all the bars have disappeared, an arrow will flash at the top of the display reminding you to change your filter. Reset your filter change indicator each time you replace your filter to make sure your water is always healthier and great tasting. The Aqualux Water Pitcher is built smart to make water filtration easy. The pitcher cover has a flip top so that you do not need to remove the entire lid to refill the pitcher. A contoured, soft-grip handle makes the pitcher comfortable and easy to lift and pour. Stylish and slim, the Aqualux is designed to fit into your refrigerator door so you'll always have plenty of cold, filtered water on hand. Despite its compact size, the pitcher holds up to 48 ounces of water, enough for six eight-ounce glasses, making the Aqualux a practical choice for your family. Water is a vital resource in energizing your mind and body, and using a Brita Pitcher ensures that the water you're drinking is in top quality. It helps your body regulate its temperature, keeps skin clear and glowing, and aids in the transport of nutrients to the brain and other organs. It also acts as a powerful aid in digestion, metabolism, and detoxification. Brita recognizes the importance of water to human well being and takes special care to optimize the healthfulness of your drinking water, so you can keep fit and energized. It's estimated that one Brita pitcher filter can substitute for the use of 300 water bottles, many of which end up in landfills. By using Brita filters, which are now recyclable through a Brita and Preserve filter recycling program, you lower your impact on the environment while benefiting your own health and possibly your wallet, too. Plus, your support of the Brita Products Company goes toward help environmental efforts like the Brita Climate Ride, a five-day bike ride whose participants raise money for climate change awareness. 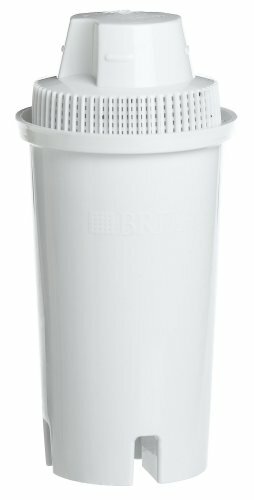 The Brita Products Company is a leader in the production of freestanding water-filtration systems designed to improve the quality of drinking water by reducing its impurities. Heinz Hankammer, the company's creator, realized the need for enhancing the healthfulness and taste of potable water in 1966. He and his family first accomplished this goal under a pear tree in the family garden and have been working to carry out their mission ever since. The company is named after Heinz Hankhammer's daughter, Brita. As a corporation, Brita is committed to community and environmental outreach through projects like FilterForGood, a campaign dedicated to the reduction of bottled water waste. One pitcher and one filter. Makes Florida water taste good! I didn't think it would be able to take the terrible taste out of Florida tap water (which tastes like drinking from a pool) but it did. The result is water that tastes extremely like some of the big brand names from the supermarket. 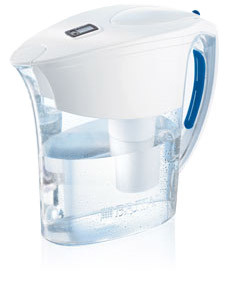 Excellent, as always by Brita, Love the Sensor. This jug has a sensor on top that will remind you to change the filter. That is one of the best features....another thing I dont have to worry about or remember until its time. The water tastes perfect to me in our home now and I have no hesitation in recommending this item. Pitcher's handle is a bit awkward when pouring, top sometimes falls off if there is water in the top holding area, the "meter" telling you to change the filter is just a timer with no connection to the filter so you reall yhave to go by how the water is tasting to determine when to change the filter. The Brita 42558 Aqualux Water Pitcher is nicely designed to fit in the top shelf of my refrigerator. Only a rectangular shape would have utilized space more effectively. Replacement filters are readily available whenever needed - as reported by a little window on the lid of the pitcher. I carefully followed the instructions for start-up. awesome pitcher. The only downside is it doesn't hold large amount of water. I bought this Brita water pitcher after reviewing a lot of filtration devices. This was one cost-effective product that was said to remove copper and other minerals. I have well water that's tested regularly for micro-organisms and its clean that way, but not for minerals. Basically my water was undrinkable, always had a scum on it. I knew there was copper and iron in it because my tub would turn blue. I don't of course use this filter for filling my bath tub. Now after almost one month daily use, my water is good to drink, to make coffee and no scum. I am glad I bought extra filters so when this runs out, a new one is ready. The Brita Aqualux Pitcher is wonderful at filtering bad taste, color, minerals. The water from it tastes and looks wonderful! HOWEVER...in the three weeks we've had it, the lid has fallen off four times while pouring. The lid does not go on securely, so if you tip it slightly too much while pouring, the lid comes off (along with all the water in the reservoir). This has happened to my 10-year-old twice and, I'm embarassed to say, me twice. The mess it creates is not worth the mess. Brita Water Pitcher is Great!! I love my new brita aqualux water pitcher. I was concerned about all the plastic I used when buying bottled water, but I disliked the smell and taste of the water from my faucet. So, I bought the Brita water pitcher. I love the design. It fits easily into my refrigerator because it is very slim. I had read in reviews of people having problems with the top coming off. I have never had the top fall off when I was pouring water. Not a problem at all! excellent instead of having lots of plastic bottle....so much easier and better for pollution. I have been using Brita water pitchers for a few years and I am a big fan of it. The taste of the water is very nice. It eliminates the need to buy dozens of bottled water every month and it helps the environment because it reduces the waste made from the plastic bottles. The previous pitcher that I have been using was poorly designed, but this pitcher is very much improved from the older ones. It's silm shape fits better in the fridge and the lid doesn't fall off when you pour, which happend quite frequently with the older model. The smaller lid is my favorite feature of this pitcher which makes filling it so easy. The electric timer is a TIMER, not a SENSOR. You reset the timer when you change the filter and the timer will count down 2 months, which is the usual lifespan of the filter. I love this water pitcher. We recently found out that we have overwhelming amounts of clorine and lesser amounts of arsenic. This baby filters out all of the yucky stuff and it's the freshist tasting water that I've tasted since I lived in up state Michigan and was tapped into an artesian well. YUMMY!